This excerpt from his personal journal (which he kept between 1800 and 1819, and published in the U.S. in 1820) is dated February 28th, 1819, shortly before he left the fur trade and ended his journal. 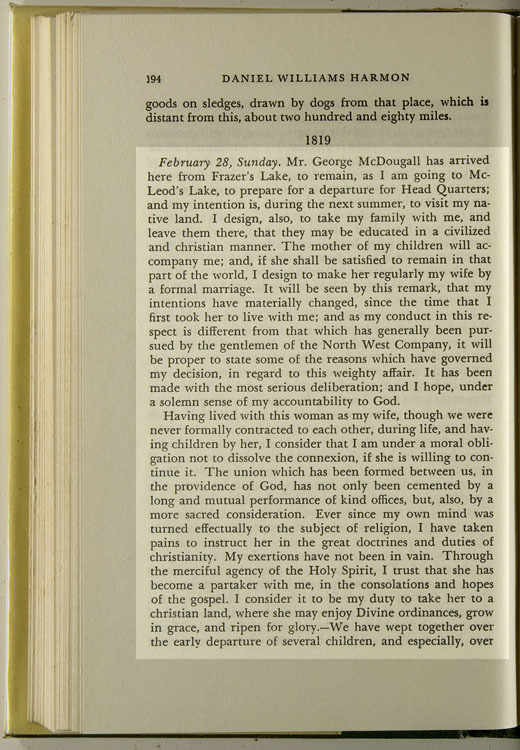 Sun, Feb 28th, 1819. p194: "Sunday, February 28, 1819... humanity would justify." "February 28, Sunday. Mr. George McDougall has arrived here from Frazer's Lake, to remain, as I am going to McLeod's Lake, to prepare for a departure for Head Quarters; and my intention is, during the next summer, to visit my native land. I design, also, to take my family with me, and leave them there, that they may be educated in a civlized and christian manner. The mother of my children will accompany me; and, if she shall be satisfied to remain in that part of the world, I design to make her regularly my wife by a formal marriage. It will be seen by the remark, that my intentions have materially changed, since the time that I first took her to live with me; and as my conduct in the respect is different from that which has generally been pursued by the gentlement of the North West Company, it will be proper to state some of the reasons which have governed my decision, in regard to this weighty affair. It has been made with the most serious deliberation; and I hope, under a solemn sense of my accountability to God. Having lived with this woman as my wife, though we were never formally contracted to each other, during life, and having children by her, I consider that I am under a moral obligation not to dissolve the connexion, if she is willing to continue it. The union which has been formed between us, in the providence of God, has not only been cemented by a long and mutual performance of kind offices, but, also, by a more sacred consideration. Ever since my own mind was turned effectually to the subject of religion, I have taken pains to instruct her in the great doctrines and duties of christianity. My exertions have not been in vain. Through the merciful agency of the Holy Spirit, I trust that she has become a partaker with me, in the consolations and hopes of the gospel. I consider it to be my duty to take her to a christian land, where she may enjoy Divine ordinances, grow in grace, and ripen for glory. --We have wept together over the early departure of several children, and especially, over the death of a beloved son. We have children still living, who are equally dear to us both. How could I spend my days in the civilized world, and leave my beloved children in the wilderness? The thought has in it the bitterness of death. How could I tear them from a mother's love, and leave her to mourn over their absence, to the day of her death? Possessing only the common feelings of humanity, how could I think of her, in such circumstances, without anguish? On the whole, I consider the course which I design to pursue, as the only one which religion and humanity would justify." In his journal, Harmon only referred to his country wife as "my woman" or "the mother of my children," but he did carry through on his resolution to marry her in a Christian ceremony after he left the fur trade. Together, they had at least 10 and perhaps as many as 14 children, some of whom died young. He took his wife (Lizette, later christened Elizabeth) and their surviving children to Vermont, where he placed their sons in school there. Although the family lived in mutual love and affection, Harmon's post-fur trade business ventures were unsuccessful: he set up a store and sawmill with his brother, but later left Vermont to try farming near Montreal. Harmon died there in 1843, leaving only a small estate to his widow and six surviving children.